While increasingly gaining mainstream status in today's data centers, this game-changing technology offers a proactive approach to IT management. It can help businesses minimize IT complexity. It can also increase network flexibility, and, at the same time, help lower TCO and provide a surprisingly fast ROI. 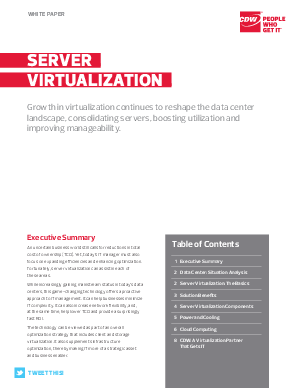 This technology can be viewed as part of an overall optimization strategy taht includes client and storage virtualization. It also supplements infrastructure optimization, thereby making IT more of a strategic asset and business enabler.